This is a summary of the thirteenth chapter of Sri Chaitanya-charitamrta describing Lord Chaitanya Mahaprabhu's appearance. Taking certain parts of this chapter, Mahaprabhu's appearance has been narrated for the pleasure of the devotees around the world. Please forgive me if I make some offence in trying to write this. Dandavats! "The entire Adi-lila section describes Lord Chaitanya Mahaprabhu's household life, and similarly the Antya-lila, the first six chapters of His sannyasa life are called Madhya-lila. During this time, Chaitanya Mahaprabhu toured southern India, went to Vrindavan, returned from Vrindavan and preached the sankirtan movement. A learned brahmana named Upendra Misra who resided in the district of Srihatta was the father of Jagannath Misra, who came to Nabadwip to study under the direction of Nilambara Chakravarti and then settled there after marrying Nilambara Chakravarti's daughter, Sachidevi. Sri Sachidevi gave birth to eight children, all daughters, who died one after another immediately after birth. After her ninth pregnancy, she gave birth to a son, who was named Visvarupa. Then, in 1407 Saka Era on the full-moon evening of the month of Phalguna, during the constellation of simhalagna, Lord Chaitanya Mahaprabhu appeared as the son of Sri Sachidevi and Jagannath Misra. After hearing of the birth of Chaitanya Mahaprabhu, learned scholars and brahmanas, bringing many gifts, came to see the newly born baby. Nilambara Chakravarti, who was a great astrologer, immediately prepared a horoscope, and by astrological calculation he saw that the child was a great personality. This chapter describes the symptoms of this great personality." Krishnadasa Kaviraja Goswami who is the author of the Chaitanya-charitamrta was a very old devotee and was going blind. Because Chaitanya Mahaprabhu gave him the service of writing His Pastimes, Kaviraj Goswami, although he could barely see, narrated Chaitanya Lila for the spiritual advancement of the fallen souls. He begins by describing that the Pastimes of Lord Chaitanya Mahaprabhu are unlimited. He mentions that just to describe one day of Lord Chaitanya's Pastimes would take about twelve years. He says, "How much can a small living entity elaborate about those transcendental pastimes?" (Adi-lila vl 3 ch13 text 45). Krishnadasa Kaviraj Goswami first explains the Pastimes of the Lord in code, summary, and then describes everything in detail. He tells about the different offerings devotees brought when the Lord appeared. He explains that many demigods came down to earth just to get a glimpse of Lord Chaitanya Mahaprabhu. Before Chaitanya Mahaprabhu was born, Advaita Acharya prayed that the Lord would descend and destroy the nescience of the material world. "Before the appearance of Lord Chaitanya Mahaprabhu, all the devotees of Nabadwip used to gather in the house of Advaita Acharya. In these meetings of the Vaisnavas, Advaita Acharya used to recite the Bhagavad-gita and Srimad-Bhagavatam, decrying the paths of philosophical speculation and fruitive activity and establishing the superexcellence of devotional service.... All the Vaisnavas took pleasure in always talking of Krishna, always worshipping Krishna and always chanting the Hare Krishna Maha-mantra. Sri Advaita Acharya Prabhu felt pained to see all the people without Krishna consciousness simply merging in material sense enjoyment. Seeing the condition of the world, he began to think seriously of how all these people could be delivered from the clutches of maya.... By loud cries He invited Krishna to appear, and this repeated invitation attracted Lord Krishna to descend. 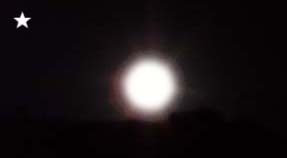 It was a full moon evening in the year 1407 of the Saka Era in the month of Phalguna (March-April) that at last, Chaitanya Mahaprabhu appeared: "When the spotless moon of Chaitanya Mahaprabhu became visible, what would be the need for a full moon full of black marks on its body? Considering this, Rahu, the black planet, covered the full moon, and immediately vibrations of "Krishna! Krishna! Hari!" inundated the three worlds. All people thus chanted the Hare Krishna Maha-mantra during the lunar eclipse, and their minds were struck with wonder. When the whole world was thus chanting the Holy Name of the Supreme Personality of Godhead, Krishna in the form of Gaurahari advented Himself on the earth. The whole world was pleased. While the Hindus chanted the Holy Name of the Lord, the non-Hindus, especially the Mohammedans, jokingly imitated the words. In this atmosphere, all the ten directions became jubilant, as did the waves of the rivers." It is mentioned that a lunar eclipse was considered very inauspicious so in order to counteract the inauspiciousness everybody was chanting "Hari! Hari!" bathing in the Ganges and presenting offerings without knowing that the Lord would appear. The Name if Hari was known to be auspicious and holy by everyone that chanted it. Even the Muslims chanted the name to prevent inauspiciousness. 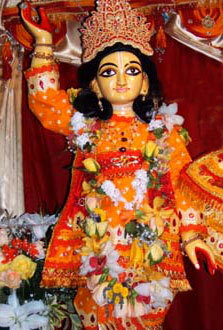 In this way, it is said that Mahaprabhu induced the world to chant the Holy Name even before He appeared. "Moreover, all beings, moving and nonmoving, were overwhelmed with transcendental bliss. Thus by His causeless mercy the full moon, Gaurahari, rose in the district of Nadia, which is compared to Udayagiri, where the sun first becomes visible. His rising in the sky dissipated the darkness of sinful life, thus the three worlds became joyful and chanted the Holy Name of the Lord." Immediately after Lord Chaitanya Mahaprabhu's birth, Sri Advaita Acharya Prabhu and Haridasa Thakur danced and loudly chanted Hare Krishna along the banks of the Ganga. The villagers, watching this ecstatic dancing could not understand what was happening. Sri Advaita Acharya Prabhu and Haridasa continued their jubilant play and bathed in the Ganges. Taking advantage of the lunar eclipse, Advaita Acharya distributed various types of charity to the brahmanas. "When he saw that the whole world was jubilant, Haridasa Thakur, his mind astonished, directly and indirectly expressed himself to Advaita Acharya: "Your dancing and distributing charity are very pleasing to me. I can understand that there is some special purpose in these actions." In this way all the devotees, wherever they were situated, in every city and every country, danced and performed sankirtan, and gave charity by mental strength on the plea of the lunar eclipse, their minds overwhelmed with joy." When the Lord appeared beneath a neem tree in the home of Jagannath Misra, many brahmanas, gentlemen, and ladies carried large plates with gifts to present to the Golden Lord. "Dressing themselves as the wives of brahmanas, all the celestial ladies, including the wives of Lord Brahma, Lord Siva, Lord Nrisimhadeva, King Indra and Vaisistha Rsi, and Rambha, a dancing girl of heaven, came there with varieties of gifts." Krishnadasa Kaviraja Goswami further explains in more detail the events, and special offerings that were offered to the Lord. In describing the nature of Jagannath Misra he says, "Jagannath Misra was an ideal Vaisnava. He was peaceful, restrained in sense gratification, pure and controlled.... Whatever money came because of the influence of his transcendental son, he gave it in charity to the brahmanas for the satisfaction of Visnu." 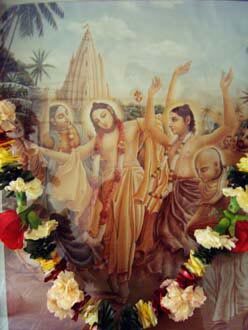 "In this way Lord Chaitanya Mahaprabhu, out of His causeless mercy, made his advent in the house of Sachidevi. Lord Chaitanya is very merciful to anyone who hears this narration of His birth, and thus such a person attains the lotus feet of the Lord."